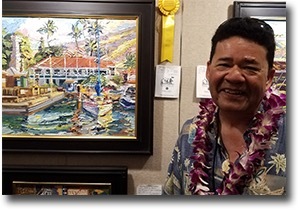 Mark Brown's dream is to build a strong plein air painting community on Oahu. The show organizer left it up to Mark to invite his friends and classes, whoever would be good contributors for the first art show in the Downtown Art Gallery. Brown's thoughts are that "Plein Air Painters are like a branch/breed (genre) of art, like how Jazz is with Music. It's an eclectic group that would benefit from more sharing: Painting is not a team sport, but painters can always share opportunities that would benefit all of us as Artist. 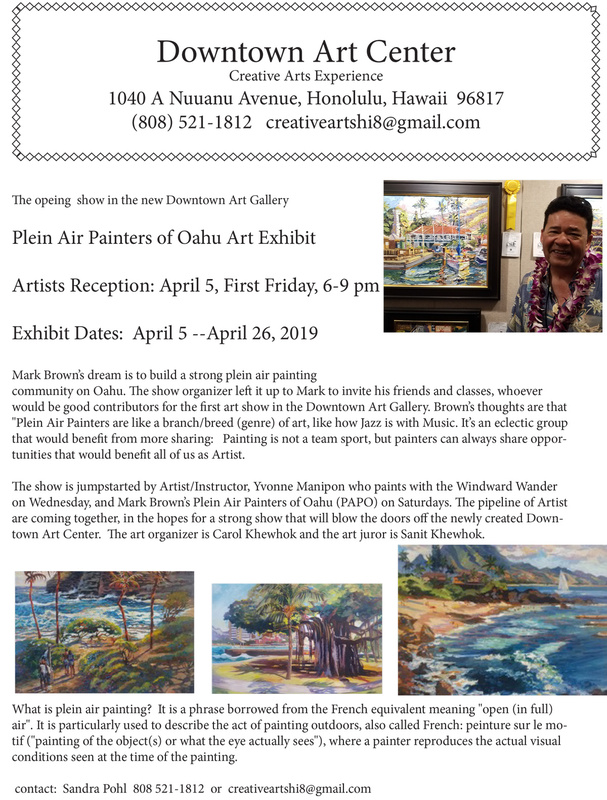 The show is jumpstarted by Artist/Instructor, Yvonne Manipon who paints with the Windward Wander on Wednesday, and Mark Brown’s Plein Air Painters of Oahu (PAPO) on Saturdays. The pipeline of Artist are coming together, in the hopes for a strong show that will blow the doors off the newly created Downtown Art Center. The art organizer is Carol Khewhok and the art juror is Sanit Khewhok. What is plein air painting? It is a phrase borrowed from the French equivalent meaning "open (in full) air". It is particularly used to describe the act of painting outdoors, also called French: peinture sur le motif ("painting of the object(s) or what the eye actually sees"), where a painter reproduces the actual visual conditions seen at the time of the painting.